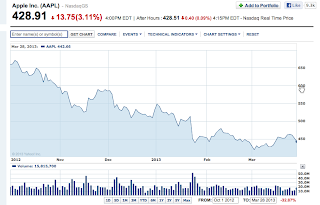 Many investors have been hurt by Apple stock's fall from grace as it nears its 52 week lows. There have been calls on Apple to buy back stock, split, or issue a dividend to help prop it up. But, Apple's fundamental thinking transcends form over substance and not to a fault. It's one thing to speak these ideals yet it's another thing to stick to your guns when your stock price is tanking while investors are suing and screaming. But, whose long term interests do the shareholders have in mind? Every shareholder could chose to not be a shareholder tomorrow but Apple cannot choose to not be Apple tomorrow. I'm an investor in Apple. But, paying dividends and buying back stock are things that Warren Buffet does since he's a finance guy. Increasing share price is not what Apple's about at a fundamental level. "Give us your money! Pay us a dividend," demanded the investors not too long ago. So, here we are less than a year later and now these same investors are calling for more money. Let's not forget that, in a publicly traded company, none of the money invested in the stock market actually goes to the corporation. For Apple, that ended with their IPO in 1980. Apple usually forgoes form over substance. As one of the biggest corporations in the world, they have no written mission statement. Save your corporate mission statements for non-profits where they really matter. Apple has no "department of innovation." All of these fundamentals are in their DNA. Propping up stock price is not. Virtually every dollar of Apple's $137B in cash and investments is reflected in a dollar's value in the company's stock price. Robbing Peter to pay Paul is shortsighted. You don't make money by buying stock, it's the selling where the money is made. Apple buying back its own stock is merely a gesture symbolizing that the company feels the stock is undervalued. Yes, it decreases the supply of the stock but Apple will never have an opportunity to sell back those shares when the stock price increases. Apple really is a different type of company. When I first started working there I initially thought that it was about design. And I don't just mean industrial design - I saw beautiful design in everything: software, user interfaces, internal hardware that no one would ever see, etc. I also realized that design wasn't just how it looked, but how it worked. However, it took me a little while to figure out Apple's DNA because I initially worked in a services division that sold into the enterprise. That was two strikes against me since Apple is a hardware company which markets to the consumer. There aren't many Apple software or services that don't directly support their hardware. If you think Apple needs to pay its shareholders more money by increasing its dividend or by buying back more stock then ask yourself, "What Apple's motivation for not doing that?" As much as I'd like to see Apple increase its dividend or buy by its stock in order to increase its share price in the short term, I know that's not what the company is about. Apple is about one thing: best possible user experience. And that user is the customer, not the employee or the investor. Apple's metric for this isn't click throughs, page views, or market share; rather, it's unit sales – with a nice margin which is the best of business models. If you build it right then they will come and stay. 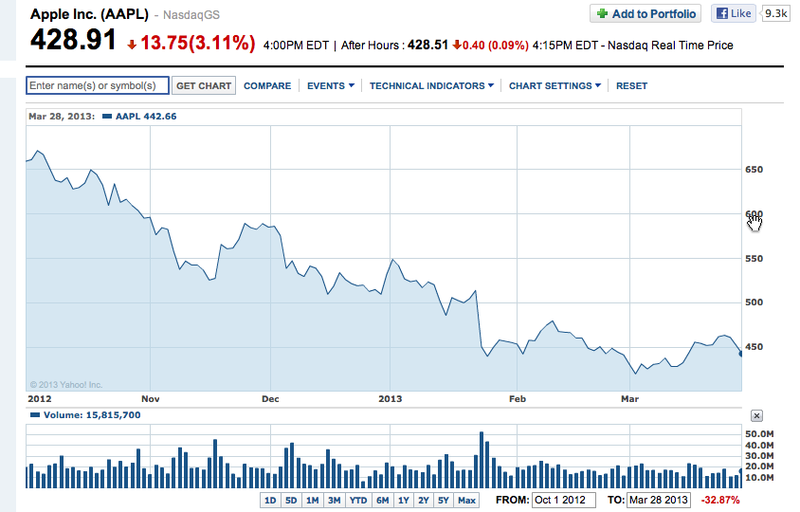 At the end of the day, Apple's investors simply feel helpless as they watch the stock price drop. What these investors really want, even more than a cash payout, is to see Apple enter and dominate a new market. I predict, if Apple gets their way, that the next market will be TV and broadcasting where viewers could unbundle their cable TV packages and, say, subscribe to individual channels via an Apple TV or iOS app. After all, this is exactly that Apple did with the iTunes store. Wouldn't it be nice (not to mention disruptive) to pick and choose which TV channels you pay for? Imagine subscribing to your local news channel, CNBC, and Spike while forgoing the weekend morning's plethora of informercials and QVC? Seriously, why am I paying my cable company to show me get-rich-quick schemes and instant weight-loss programs?